Prior to the 2017 Asian Mission, Vassula had visited the Philippines eleven times. She went as far north as Tuao, Cagayan Valley, and as far south as Davao, in Mindanao. This year, when the archbishop of Cagayan de Oro (another city in Mindanao), His Excellency Most Rev. 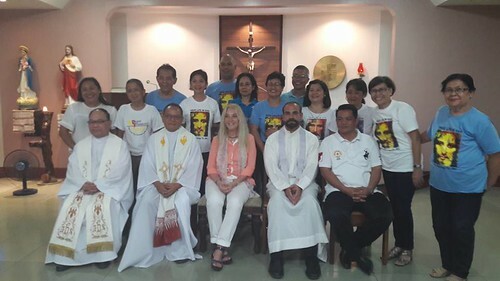 Antonio J. Ledesma, SJ, DD, learned that Vassula would be in Asia, he invited her to share the messages of True Life in God with the people of Mindanao. Vassula’s twelfth visit to the Philippines meant that she would enter the country twice, due to her travel itinerary. 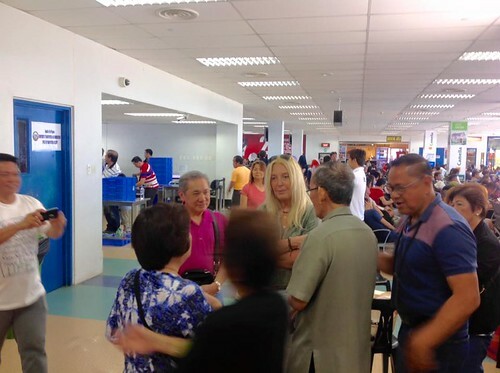 During her first entry into the country, she had ample time to physically adjust to the Asian standard time zone. She and her companion, Rev. Fr. Joseph Iannuzzi, STL, arrived at the Ninoy Aquino International Airport on Friday, February 24, 2017. 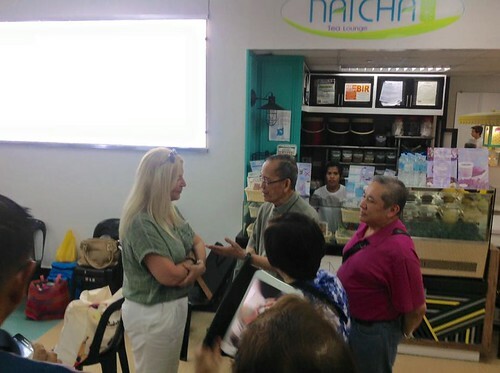 They were welcomed by members of the True Life in God Philippines Association. February 26, 2017 (Sunday): After resting and recovering from jetlag for a day and a half, Vassula’s first activity in the country was a welcome lunch meeting with members from the Center for Peace Asia and the True Life in God Philippines Association, graciously hosted by the family of Mr. and Mrs. Salvador De Leon. 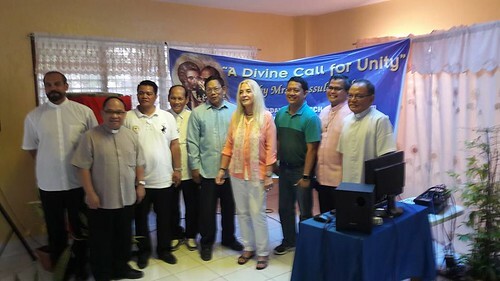 The Center for Peace Asia, together with Ms. June Keithley Castro (a friend of Vassula’s, now deceased), first invited Vassula to the Philippines in 1991, when there was still no True Life in God Philippines Association. This group has helped promote Vassula’s TLIG missions. The first event of the day was a Holy Mass celebrated by Fr. Joseph Iannuzzi, con-celebrated by Fr. Richie Santos, SDB and Fr. Delio Ruiz, SCJ. The very relaxed atmosphere was highlighted by Vassula’s stories about her recent mission to Syria and Lebanon, and an explanation of how important the mission of TLIG is for our time. Due to its importance, most of Vassula’s friends acknowledged their enthusiasm towards providing assistance for the TLIG missions. February 27, 2017 (Monday): Even though Vassula’s lay-over in Manila was supposed to have no major activity, J. C. Gotinga of CNN-Philippines contacted the TLIG Philippines Association, asking if it would be alright to interview Vassula. Upon hearing this, Vassula agreed to do the interview at around 2:00 p.m. J. C. knew a little about the messages and Vassula, because he became acquainted with True Life in God when he was still in school, more than 15 years ago. He said it took him some time to receive his boss’s approval to do the interview, thus the late notice. The interview lasted almost an hour. 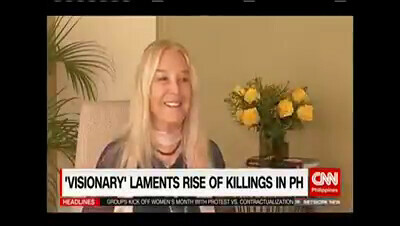 The important parts of the interview were aired on Ash Wednesday, March 1, 2017, during the CNN-Philippines Evening News. February 28, 2017 (Tuesday): A bit past 3:00 a.m. the following day, Vassula and Fr. Joseph checked-in at the airport for their flight to Beijing, the first leg of their Asian Mission, which would also take them to Vietnam, Sydney and then back to the Philippines. March 22, 2017 (Wednesday): Vassula and Fr. Joseph arrived in Manila and checked into their hotel, located near the terminal, had a quick dinner, and rested from their eight-hour flight from Sydney. March 23, 2017 (Thursday): The following day we were on-board our 2:20 p.m. flight headed for Cagayan de Oro (CDO). 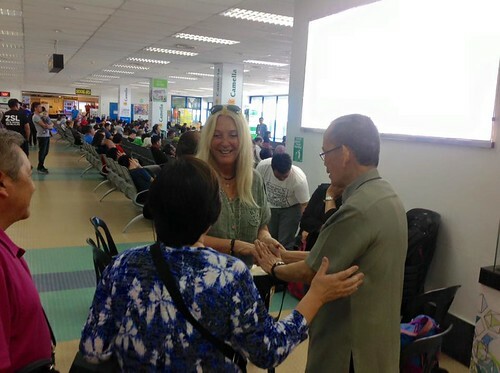 We were welcomed at the Laguindingan Airport by the True Life in God–CDO prayer group led by a married couple, Cecille and Anthony Somido. Fr. 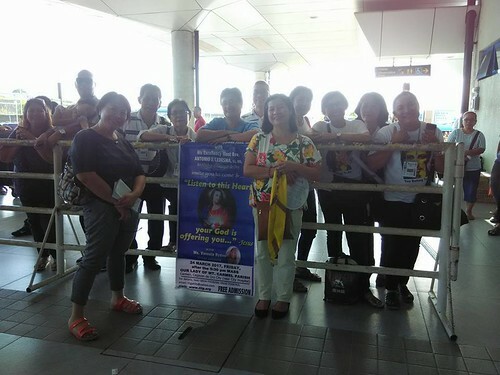 Julio Gaddi Jr., the spiritual adviser of the Philippines Association, was also there, together with TLIG-Cebu prayer group members who came to help sell TLIG books at the public meeting the following day. 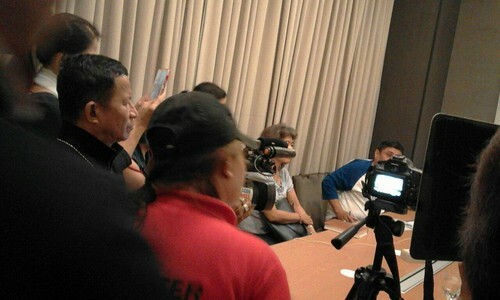 On our way to the hotel, while still caught in the city’s rush hour traffic, we were informed that those who would be interviewing Vassula ‘live’ over three local radio stations, including the radio station of the Archdiocese of Cagayan de Oro, were already waiting at the hotel. After checking-in, Vassula did not keep the reporters waiting. She immediately proceeded to the conference room where the interview was to take place. Vassula being interviewed “Live” by three local radio stations, while Fr. Joseph Iannuzzi (at right) listens. When asked how other religions have received her, she said that she is amazed that she has been received well by other religions. Buddhists and Hindus in Bangladesh have thrice awarded her the Golden Medal for propagating harmony, peace and unity. Hence, Buddhists have invited her in Hiroshima to give a talk in their temple. And lately, Muslims have invited her to Syria and Lebanon for an interfaith dialogue with muftis and imams. The live interview lasted for almost an hour. 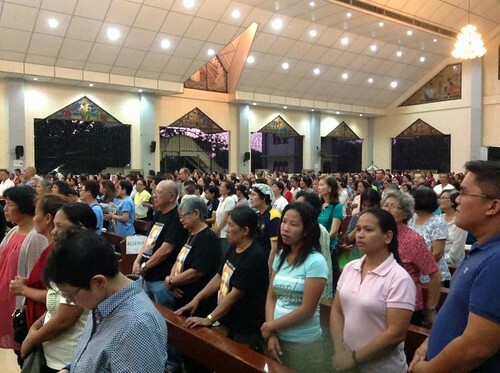 Within it, the public was invited to come to Vassula’s witness meeting, scheduled on March 24, after the 5:30 p.m. Mass at Our Lady of Mount Carmel Church in Carmen, Cagayan de Oro City. March 24, 2017 (Friday): By 10:00 a.m. we were on our way to the office of His Excellency Most Rev. Antonio J. Ledesma, SJ, DD, the Archbishop of Cagayan de Oro, for our 10:45 a.m. courtesy visit. Upon our arrival, the archbishop led us to his receiving hall. He graciously invited everyone to pose for photos before he spoke with Vassula, Fr. Joseph and the rest of the group. Vassula firstly presented him with the TLIG One Book and Heaven is Real but so is Hell. He asked Vassula about her mission on Unity, and he was pleasantly surprised to learn that even the Muslims, who attended Vassula’s conference in Syria, were interested to know what Jesus is saying to her in the TLIG messages. At the end of this conference, many Muslims were interested to not only have the Heaven is Real but so is Hell book, which is her autobiography, but also to obtain the TLIG One Book. As a confirmation to the authenticity of the messages, Fr. Joseph explained the CDF clarifications in the appendix of the TLIG One Book. Vassula told the archbishop about her vision of Our Lady telling her that it is not enough to feed people with spiritual food; they need physical food as well, especially the poor. And so, TLIG prayer groups opened centers to feed the poor and hungry, known as Beth Myriams (House of Mary) around the world. She showed pictures of some of the TLIG Beth Myriams, adding that there are Beth Myriams in the Philippines: in Cagayan Valley, in Manila and in Calbayog. 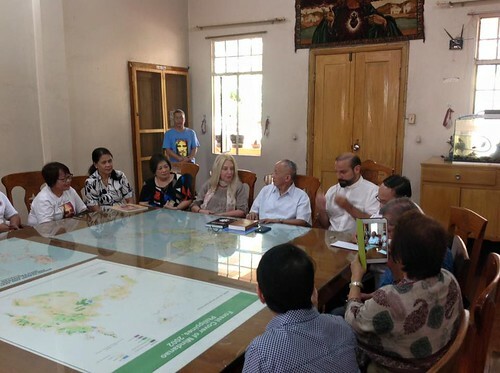 The conversation then shifted to a discussion about the ecumenical activities of TLIG, which thoroughly interested the archbishop, as he is working very hard for peace and harmony in the Muslim areas of Mindanao. Vassula invited the archbishop to the TLIG Ecumenical Pilgrimage in Moscow in September so as to have a foretaste of the Unity that Jesus is longing for. Fr. Julio Gaddi Jr, who was with us, showed him photographs of previous pilgrimages, which interested him very much. 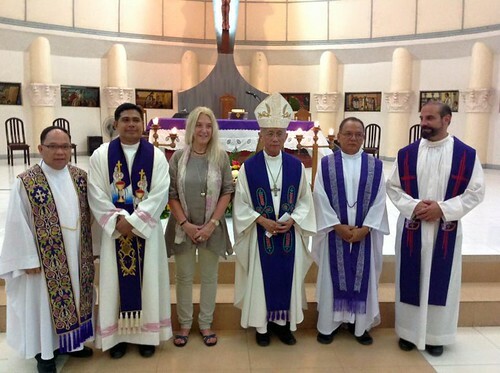 Vassula with TLIG-Philippines: courtesy visit with Archbishop Antonio Ledesma, SJ, DD. 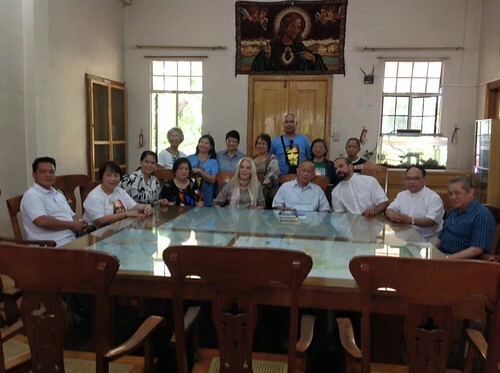 Seated from left: Evangelical Pastor Jonathan Pineda, Avelina Rosales (TLIG-Cebu), Tina dela Cruz (TLIG-Antipolo), Cora Zaballa (TLIG-Quezon City), Vassula, Archbishop Antonio Ledesma, SJ, DD, Fr. Joseph Iannuzzi, Fr. Julio Gaddi (TLIG-Phils. spiritual adviser), Raymond Lara (TLIG-Quezon City). When we arrived at Mt. Carmel Parish in Carmen, Cagayan de Oro City for the 5:30 p.m. Mass and Vassula’s talk, members of TLIG prayer groups from Quezon City, Cebu and Davao were already selling TLIG books near the church entrance. A few soldiers with bomb-sniffing canines were on site to ensure public safety. The Holy Mass was celebrated by Archbishop Antonio Ledesma, SJ, DD, and con-celebrated by Fr. Julio Gaddi Jr., Fr. Bon Genson, SSJV, the assistant parish priest of Our Lady of Mt. Carmel Parish, Fr. Indra Pamungkas, SCJ, and Fr. Joseph Iannuzzi. Fr. Julio Gaddi Jr., Fr. Bon Genson, SSJV, the assistant parish priest of Our Lady of Mt. Carmel Parish, Vassula, Archbishop Antonio Ledesma, SJ, DD, Fr. Indra Pamungkas, SCJ, and Fr. Joseph Iannuzzi, STL. The archbishop’s homily focused on “the two greatest commandments.” He then informed the public about the Vatican II Decree on Ecumenism, encouraging Catholics to reach out to people of other beliefs. By uniting and loving one another, we shall be fulfilling these commandments. He then reiterated his invitation for everyone to stay for Vassula’s presentation after the Mass. Immediately after Mass, the program began with welcome remarks from Archbishop Ledesma. Vassula was then introduced by Fr. Joseph Iannuzzi. Since this was the first time Vassula was invited to speak in Cagayan de Oro, she asked for a raise of hands from those in the audience who were hearing about the True Life in God messages for the first time. The archbishop humbly raised his hand, along with many others in the audience. It is worth mentioning that the audience was not only composed of people from Cagayan de Oro, but also from the nearby islands, cities and towns, like Ilagan City, Davao City and Cebu City. Some even travelled from Manila and Laguna. Vassula firstly narrated the beginning of her call. She explained how she receives the messages through interior locutions and at times, through a light in her intellect. She admitted her prior ignorance about spiritual things, and her distance from God at the beginning of her call. At the time, she thought that there was only one Church with different nationalities. Then when God the Father approached her and said, “I am your Father” (cf. TLIG Messages, July 25, 1987), His words affected her in a manner that brought meaning to her heart. She said that the messages of True Life in God are God’s gift for our times. It is God’s call to repentance, to a life of unceasing prayer, to a life of reconciliation and to Unity in diversity. God comes to us in these messages to not only console us, but also to re-educate us. She said that Jesus is even sending Our Blessed Mother in over 300 apparitions around the world (according to author Msgr. René Laurentin), to bring us all back to Her Son, Jesus. In a vision she experienced when she was around 11 years of age, Vassula saw herself walking near Christ, getting ready to marry Him; then she entered a room where Mama Mary was waiting for her with two other holy women. With smiles, Mother Mary began arranging her marriage dress, pulling it here and there; then, simultaneously, she was fixing her hair, trying to perfect her for Her Son. This is indeed one of Mama Mary’s roles: to reach out and perfect us for Her Son Jesus Christ. “Conversion is not a one-time thing…it never stops,” she said. Vassula went on to tell the audience about her mission on Unity. She spoke of another vision--of the three iron bars, representing the three different Christian denominations: Catholic, Orthodox, and Protestant. She asked, “How can the heads of these three bars meet unless they all bend in humility and love? The keys to Unity are humility and love. Satan is the divider and our division maimed the Mystical Body of Christ. Can a body that is maimed function well?” The Lord finally asked Vassula to pull out the lance’s blade that lies deep in His Heart. Christ enabled her to understand that the blade represents our division and that she has to work for Christian Unity. After Vassula’s talk, Fr. Joseph showed the print on canvas painting of “Christ’s Agony in Gethsemane” painted by Vassula. 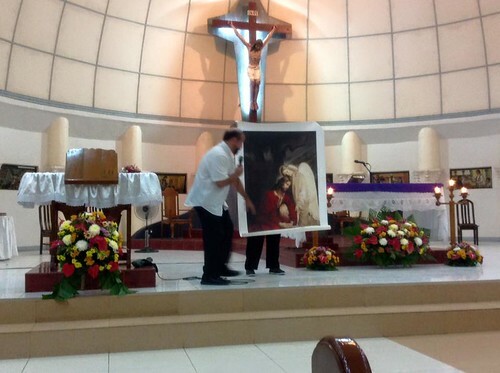 He informed the audience that anyone who purchases this limited edition canvas will be helping TLIG in its mission for Unity and its apostolate towards feeding the poor through the Beth Myriams around the world. 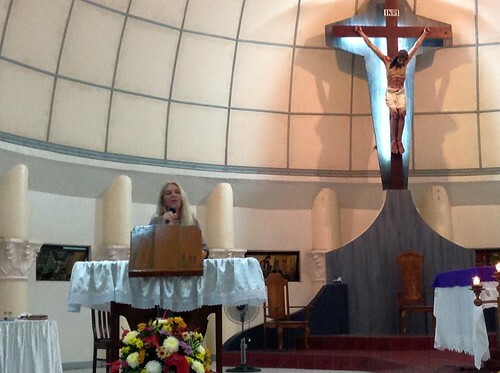 Subsequently, Vassula asked everyone to stand up to pray the “Prayer for Healing and Deliverance” raising her crucifix which holds the relic of the True Cross. After the prayer, Vassula asked everybody to sit down again as she narrated one (last) lesson on “WE, US.” (cf. TLIG Messages, July 14, 1988) She said, “One day, while I was receiving a dictation from Jesus, which sometimes takes a few minutes, but sometimes it takes hours, I remembered I was cooking something in the oven, which could get burned if I don’t turn it off. Jesus did not say, ‘go down and turn it off.’ He said, ‘What are WE waiting for? Let US go and switch it off!’' Remember always the Presence of Jesus by practicing the “WE, US." Vassula requested everyone to pray for Unity, especially for the unification of the dates of Easter between the Orthodox and the Catholics. She told the audience of Jesus’ promise that if we unite the dates of Easter, He will send the Holy Spirit in full force so that the Church completely unites in diversity. Moreover, all these terrorist movements will stop! The program ended with a song from the choir. Many books were sold, especially the TLIG One Book and Heaven is Real, But so is Hell. Thanks be to God for this blessed day! March 25, 2017 (Saturday): After yesterday’s full schedule, we left the hotel after noon to go to the Sacred Heart Formation House in Aluba, Macasandig, for an ecumenical conference. On our arrival at Cagayan de Oro two days prior, we had learned that the priest who was supposed to help organize this ecumenical conference had not sent out the invitations that were given to him three weeks before the event! When the archbishop heard about this, he immediately contacted a friend from the Xavier University Campus Ministry, asking him to invite some Protestant pastors. 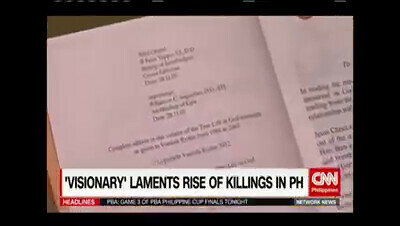 Three pastors came from Xavier University: Rev. Pastor Pedro A. Sarceda of the Cagayan de Oro Evangelical Ministers Association (COEMA) Free Methodist Church (FMC), Rev. Joel Bagundol, and Rev. Ricardo C. Yanez Jr. (both from UCCP: United Church of Christ in the Philippines). Also present were Evangelical Pastor Jonathan Pineda from Binangonan Rizal and Brother Antonio Bermudez, MSPM. At the Ecumenical Conference with Fr. Joseph Iannuzzi, Fr. Julio Gaddi Jr., Pastor Jonathan Pineda (Evangelical Church, Binangonan Rizal), Bro. Antonio Bermudez, MSPM, Rev. Pedro A. Sarceda (COEMA FMC), Vassula, Rev. Joel Bagundol and Rev. Ricardo C. Yanez Jr. (both from UCCP: United Church of Christ in the Philippines) and Fr. Indra Pamungkas, SCJ, our host. The program began with an opening prayer and a welcome greeting from Fr. Indra Pamungkas, SCJ, an Indonesian priest formator for the SCJ seminary in Pagadian City. He was involved with TLIG-Philippines during the rehabilitation of Botong Island in Banatayan, Cebu, for the victims of Typhoon Haiyan (Yolanda). He came to the 2015 TLIG Ecumenical Pilgrimage in Rome, and is spiritually guiding some TLIG Filipino youth in Cavite and Ilagan City. Last year, he helped organize Vassula’s mission to Indonesia. She said that the ‘devastation’ the Lord speaks about surfaced through our division which in turn brought a great apostasy in the world. She said that this apostasy is greater in the West: that is, in Europe and the United States of America. 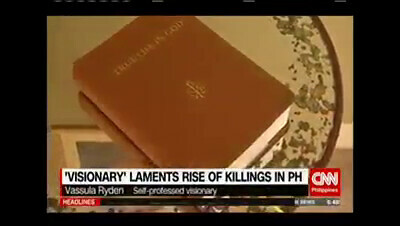 She said, “Here in the Philippines, I can see Christianity still hanging in. And I always talk about the Philippines. That if everybody was like the Filipinos, maybe God would not have come and start calling us to repent and terminate our division.” She said that apostasy has been stretched so badly in Europe that the church dioceses are selling churches and cathedrals because they are empty. She continued, “And while the West is selling their cathedrals, the East, which is Russia, is building cathedrals and repairing those that during communism were torn down because they are so packed with lay people. Their faith, which had been prohibited for so for many years under communism, has come back. They are really clinging onto Jesus Christ, and are never letting go. They are so crowded in their churches that they are building cathedrals to put in their people." "This has been prophesied in Medjugorje, and also in True life in God. Russia will glorify God more than any other country. The search for reconciliation and Unity must pervade the whole life of the Church and should become our priority, so as to reach this goal, which is Christ’s goal. It is our due to God, it is our obligation to God, and it is our responsibility to safeguard the credibility of the Church. However, no matter how much the Church struggles to attain this goal of Unity, so long as the Feast of Easter is not unified and not celebrated as one date, our division will remain and there will be no progress. For years now, Christ has been asking the people of His Church to unify the Easter dates. If this is done, He will do the rest to unify us all and to bring us to complete Unity in diversity. If Christ asks us to do something, it’s because it’s an easy step to take. He does not ask us to take any difficult steps." Vassula warned the audience that if they live that Unity, people in authority will prohibit them from spreading it, as did the rulers, elders and scribes who persecuted Peter and John. The Lord says, “they hold the keys to the Kingdom of God, neither do they enter themselves nor allow others to enter.” (cf. TLIG Messages, August 5-29, 1990) She advised, “Today, our response should also be the same as Peter’s and John’s, who had said, 'You must judge whether in God’s eyes it is right to listen to you and not to God. We cannot promise to stop proclaiming what we have seen and heard.’” (Acts 4:19) She encouraged everyone to pray much for Pope Francis to be inspired to unite the dates of Easter. She ended her talk by asking everyone to stand and pray together the “Prayer for Unity” from the TLIG message dated April 30, 1990, which was printed on prayer cards and distributed to the audience. The Protestant pastors were taking notes as Vassula spoke. After the talk, Pastor Jonathan spoke of an experience he had with the TLIG-Antipolo prayer group members and attested that yes, the TLIG messages really do come from God. Vassula then opened the floor for a question-and-answer session. Our Protestant pastors asked some interesting questions which Vassula and Fr. Joseph gladly responded to. Members of TLIG-Cagayan de Oro prayer group with (seated) Fr. Julio Gaddi Jr., Fr. Indra Pamungkas, SCJ (our host), Vassula, Fr. Joseph Iannuzzi, and Pastor Jonathan Pineda. A very rare opportunity for a “selfie” with Vassula. March 26, 2017 (Sunday): The next morning, we were picked up from our hotel to catch our 11:00 a.m. flight back to Manila. While at the waiting lounge of the airport, our group met His Excellency Most Rev. Paciano B. Aniceto, DD, Archbishop Emeritus of San Fernando, Pampanga, whom we met last January while he was leading the Ecumenical Liturgy for the first day of the Week of Prayer for Christian Unity in San Fernando, Pampanga. Archbishop Paciano Aniceto was pleased to meet Vassula at the lounge of Laguindingan Airport in Cagayan de Oro while waiting for the flight to Manila. The archbishop told stories of ecumenical efforts of the church in his archdiocese while we informed him of the mission of TLIG on Christian Unity. Our plane landed in Manila shortly before 1:00 p.m. We were able to partake in a Mass, a short meeting, and a late lunch with very little rest, before leaving for Vassula’s live interview at ABS-CBN’s DZMM Teleradyo “Salitang Buhay” (“The Word Alive” in English), aired every Sunday from 8:30 – 10:00 p.m. The program is hosted by two SVD (Society of the Divine Word) priests: Fr. Bel San Luis (also a columnist of the Manila Bulletin newspaper) and Fr. 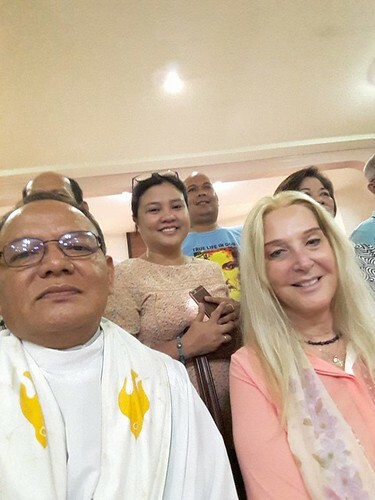 Jerome Marquez (a parish priest of the Diocesan Shrine of the Sacred Heart of Jesus), and a lay person, Ms. Ilsa Reyes (involved with the Ministry on Inner Healing). Along with the hosts, Fr. 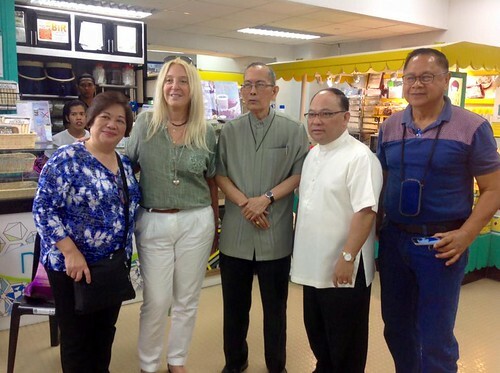 Roland Tuazon, CM, came to see and support Vassula. Fr. Roland, assistant chair of the Quezon City Ecumenical Fellowship (QCEF) group, was responsible for organizing Vassula’s ecumenical meeting last year, so as to share TLIG at Santuario de San Vicente de Paul parish in Tandang Sora, Quezon City, in the Diocese of Novaliches. 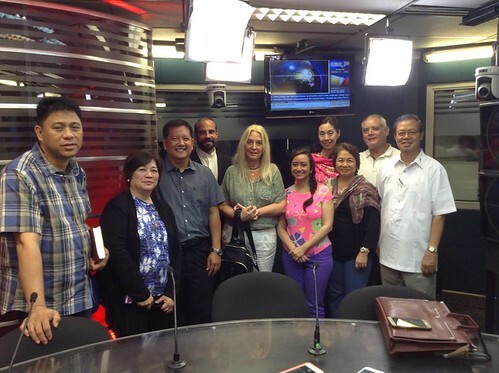 This radio program reaches Filipinos overseas--the Middle East (Saudi Arabia, Dubai, etc. ), as well as subscribers of TFC (The Filipino Channel) in the USA, Canada, and Europe. The program may also be accessed through the Internet, via live streaming. After having been introduced by Fr. Bel, Vassula shared the beginning of her call 32 years ago. She also spoke of her mission. When the Lord asked, “Which house is more important, your house or My House?" She answered, “Your House Lord.” Jesus then said, “Revive My House, embellish My House, unite My House.” (cf. TLIG Messages, November 28, 1995) At the beginning, Jesus had to teach her slowly; He even had to teach her the meaning of some Scripture passages. Jesus prepared her for the TLIG mission by teaching her to die to herself so that the Holy Spirit could breathe inside her. 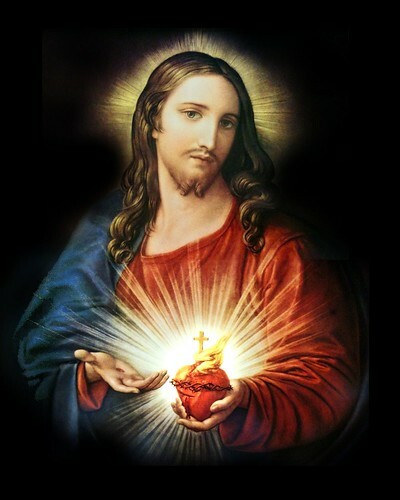 This is what Vassula is trying to transmit to the people: the Love of God, the Mercy of God, the need to die to oneself to respond to the Holy Spirit within, and the call to Unity that Jesus wants. 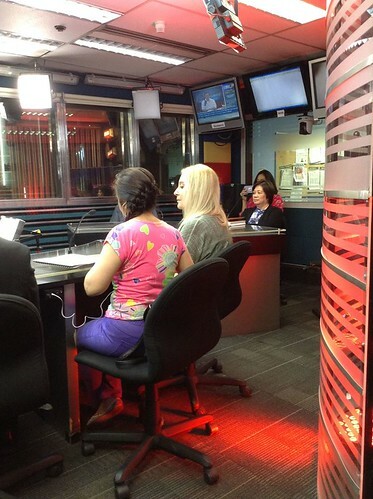 Vassula seated beside Ilsa Reyes, the only lay anchor woman of the radio show, “Salitang Buhay”, who also attended Vassula’s talk in 2016 at Santuario de San Vicente de Paul parish in Tandang Sora. Toward the end of her interview, Vassula mentioned the Beth Myriams--TLIG centers established around the world for the feeding of the poor. As an extension to the interview, people also called in, asking for the official TLIG website, where the TLIG books can be purchased and for their prices. After the radio show, the interview continued until we said goodbye to our hosts in the lobby of the station. A group photo after the show: From left, Fr. Jerome Marquez, SVD, Cora Zaballa, Fr. Roland Tuazon, CM , Fr. Joseph Iannuzzi, Vassula, Ilsa Reyes, Mica Lara, Celia De Guia, Ari Lara, and Fr. Bel San Luis, SVD. 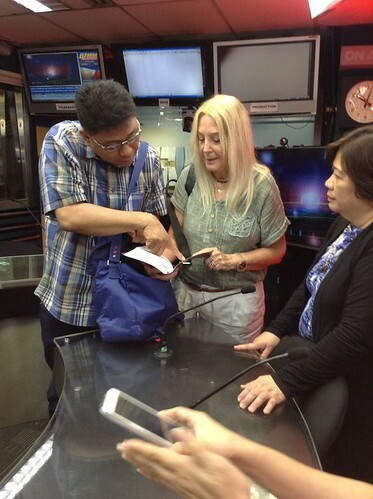 This radio interview concluded Vassula's twelfth visit to the Philippines and her 2017 Mission to Asia. March 27, 2017 (Monday): The following day, Vassula and Fr. Joseph had ample time to rest prior to their long trip back to Athens. They checked-in at the airport at 10:00 p.m. for their 12:40 a.m. flight on March 28.
a triumph for Our Triune God!